Pot in this image is the small size 48 H x 33cm, The medium size is 58 H x 44cm and the large is 70 H x 54cm. Available in Black, Blue, Tropical Green, Tropical Red, Cream. 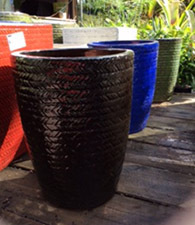 Chevron Tall Round med $120.00 Special price: $0.00. Not online sale. Chevron Tall Round lge $160.00 Special price: $0.00. Not online sale.